Giddings, who represents the 7th Legislative District, is an officer in the Air Force Reserve. She previously served nine years in the U.S. Air Force, including three combat tours in the Middle East. 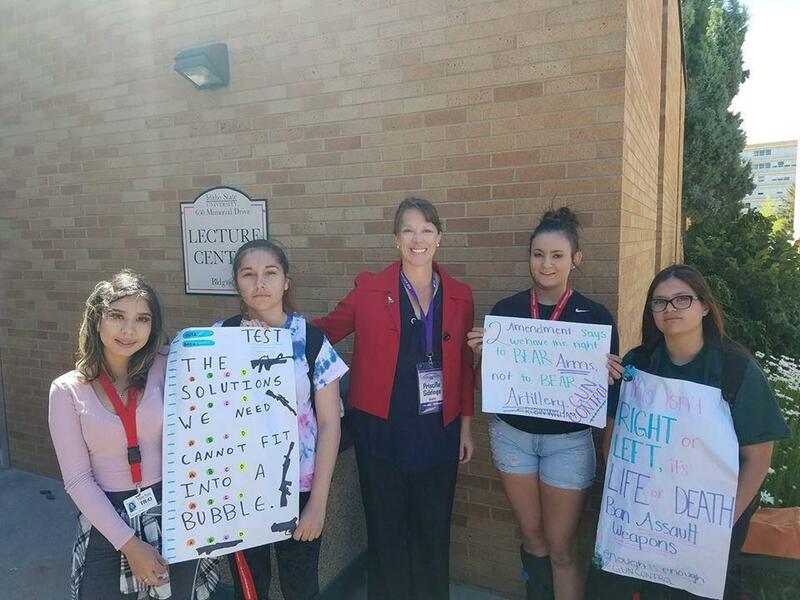 While in Pocatello attending the Idaho GOP state convention, the first-term lawmaker posted a picture on her Facebook page of her standing with four girls who were carrying posters advocating for gun control. The post went viral almost immediately, receiving more than 2,200 comments within the first six hours. People also tweeted a screenshot of the post, eliciting thousands more comments on that platform. Most expressed varying degrees of disgust or disappointment, but several people took the remark as an implied threat. Only a handful defended Giddings. Giddings did not respond to a request for comment. She also declined to speak with an Associated Press reporter, but said she would release a statement. Of the first 100 comments on her Facebook post, all but three were critical of her remark – particularly as it came a day after a mass shooting at a Maryland newspaper office. “What a poor example you are, even for a politician,” one man wrote. Giddings’ defenders, however, criticized commenters for their perceived liberal bias. Another suggested that showing the girls an empty shell casing hardly qualified as a threat. “Everything that’s said, you jump on and make it into something it’s not. I see no threat,” she said. Giddings is running for re-election this year. She defeated two challengers in the May 15 Republican primary. No Democrat filed for her legislative seat so, barring a successful write-in challenge, she’ll be elected to a another two-year term in November. Published: June 30, 2018, 6:36 p.m. Updated: June 30, 2018, 6:37 p.m.